Part 2: Heterogeneity and architectures become focus as scaling benefits shrink; IP availability may be problematic. Pushing to the next process node will continue to be a primary driver for some chips—CPUs, FPGAs and some ASICS—but for many applications that approach is becoming less relevant as a metric for progress. Behind this change is a transition from using customized software with generic hardware, to a mix of specialized, heterogeneous hardware that can achieve better performance with less energy. Over the past decade, the trend has been to add more functionality into software because it is easier to fix and update. But that approach is slower, uses more power, and it is less secure. And because there is no longer an automatic improvement in power and performance with each new process node, chipmakers are stepping back from trying to do everything in software. It moves the chip hardware much closer to the customer, allowing chipmakers to become more involved in end markets than at any time since the PC era. Hardware-software co-design a requirement rather than an option, and forces iterative design improvements on both sides. The emphasis is on more individualized designs, rather than megalithic one-size-fits-all chips. This has led to changes in design strategies within chip companies and systems companies. Underlying these developments is a broad shift in the market for semiconductors. There is no new single platform that will drive sales of 1 billion or more chips based on a single SoC design. Apple and Samsung have split the high end of the smart phone market, with creeping erosion of their positions by companies such as Huawei, Oppo, Vivo and Xiaomi, among others. Fig. 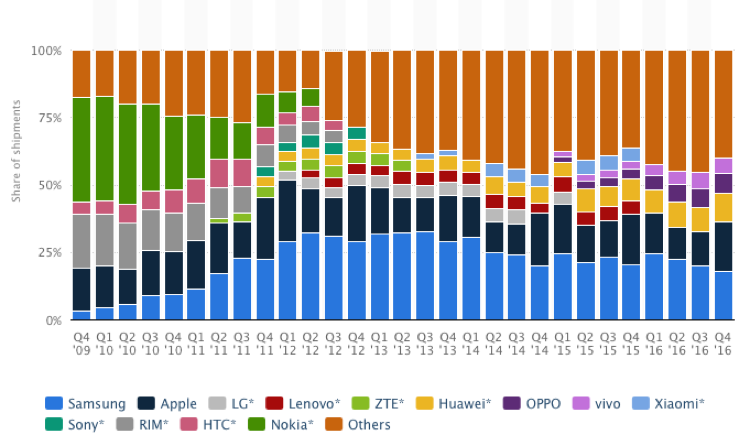 1: Market share of smartphone vendors. Source: Statista. This does not point to a shrinking of demand for semiconductors. Far from it, in fact. The market for semiconductors is looking quite robust—particularly in terms of volume. But there is no single platform generating the same kinds of single and/or derivative design volumes as smart phones, and within an array of new markets the reasons for moving to the next process node are less obvious. So rather than create a single roadmap for semiconductors, which is what the International Technology Roadmap for Semiconductors managed until last year, the IEEE is breaking that down into a number of specific market areas under the moniker of the International Roadmap for Devices and Systems (IRDS). Among the focus areas so far are such things as big data analytics, feature recognition, optimization for self-driving cars, and graphics for virtual and augmented reality. “What we are creating is much more application-driven,” said Tom Conte, co-chair of IEEE’s Rebooting Computing Initiative and a professor of computer science and electrical and computing engineering at Georgia Tech. “All of the focus teams will create mini roadmaps.” He noted that parallel to this effort, Japan is developing its own application-driven semiconductor roadmap called the System & Device Roadmap of Japan. This is especially important outside of mobility, which will continue to push for greater density. Compounding the difficulty of moving to the next process node is the availability of IP. Developing IP at the most advanced process nodes is expensive, and returns are uncertain. For one thing, every foundry’s process is different enough below 40nm that it’s a burden for IP vendors to keep up with all of the different possible nodes and implementations at the same node. For another, even within a single foundry’s process, the development process at the most advanced nodes is so complex that IP vendors complain they are often starting well below version 1.0—sometimes version 0.1 or earlier. That carries over into the SoC world, as well, where there is a growing emphasis on bigger integrated blocks and subsystems rather than individual IP blocks. There has always been a substantial amount of uncertainty with each new node, and most chipmakers working at these nodes accept that as one of the challenges of working at the leading edge. But two important things have changed. First, there are more factors in flux at each new node and more things that can go wrong because of that. Second, the markets themselves are in transition because most of the big opportunities in the future are in new areas, unlike in the past, where there was an evolutionary path to follow from the mainframe to the PC to the smartphone/tablet/phablet. That makes obsolescence a big problem, which is obvious today in cars that are several years old because they don’t support texting or search using 4G phones. Obsolescence is costly, which is one of the driving factors behind IEEE’s application-specific roadmaps. Software initially was one way to deal with that, and it will continue to play a role because it’s easier to modify software than hardware. But FPGAs are growing in popularity, as well, because as the name indicates, they can be programmed in the field. Another change that affects Moore’s Law is an explosion of data. Ever since the introduction of the PC there has been debate over whether to centralize or distribute data. While some of those debates were political in nature—pitting IT departments against mobile users, and big-iron companies and their ecosystems against mobile device makers and their ecosystems—those arguments are now largely moot. The sheer volume of data makes it much more efficient to process some of the data locally and move only a subset of that data. In effect, the processing moves closer to the data, with the chips optimized for certain types of data, rather than the other way around. 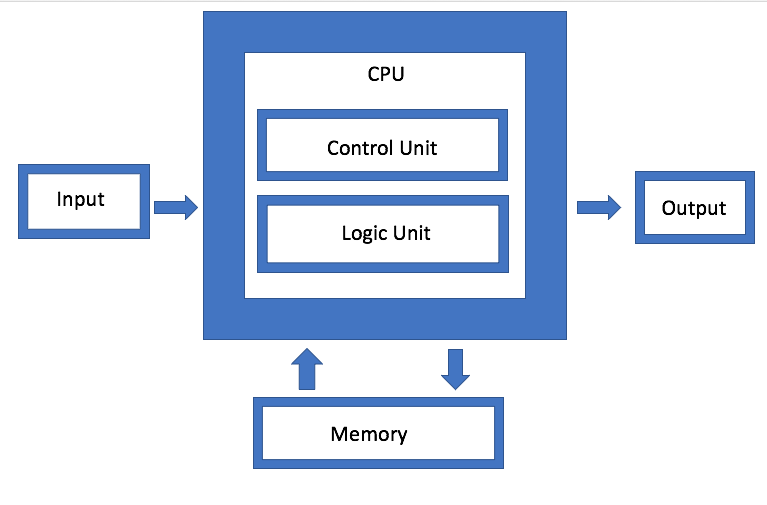 So rather than send everything through to memory, multiple caches and proxy caches can shortcut the flow of data from accelerator chips to different devices. While this is technically still a von Neumann architectural approach, it’s a much more fine-grained version of it. The big difference is that the starting point is the data and follows how it moves, rather than relying just on a centralized chip architecture to handle everything. In effect, it puts the burden on the architecture, which is defined by the software, rather than the speed or process geometry of any single chip. A new factor that comes into play across all of this is security. It’s harder to hack hardware than software, because if it’s architected correctly it requires a device to be physically present. Software, on the other hand, is easier to breach remotely. Ultimately this makes a stronger case for putting more functionality across multiple hardware components. But it also adds to the cost, which so far has limited its adoption. Still, security adds yet another element to software-driven design that needs to be factored in. What is evident is there are many routes to the same goal from an engineering perspective. And while Moore’s Law is often synonymous with shrinking features, the underpinnings are economic. The goal is smaller, faster and cheaper, but without the cheaper part the other two factors would never happen. As scaling continues to slow, the real challenge is continuing the economic benefits of Moore’s Law, and that’s where EDA companies see a big opportunity. That kind of gain can delay the need to move to the next node every two years. On the flip side, faster tooling and better training on those tools can make a dent in how much time, and therefore money, is spent on the design side. Moore’s Law is alive and well in one respect. From a digital logic standpoint, it is possible to continue shrinking devices at least to 5nm, and perhaps beyond. But it is getting harder, more expensive, and the benefits don’t match up well with many market segments. Increasingly, there solutions are being designed for specific markets using a variety of components that are heterogeneous, software-defined, and much better suited for different tasks. The era of one-size-fits-all is coming to a close, and that is making broad statements about semiconductor development far less relevant. Predictions about software-driven design with commoditized IoT hardware were wrong. RISC V ISA based low cost smaller area CPU cores with custom features and specific SW to run on them could be future trend for specific applications. Almost all specialized applications in almost all fields (which are not consumer centric) are moving towards (on the fly) customizable hardware to some extent since they are programmable while maintaining performance. This trend is going to increase. Only the extremely cost sensitive consumer centric devices are going to be driven by Moore’s law till the very end when the law itself becomes obsolete.